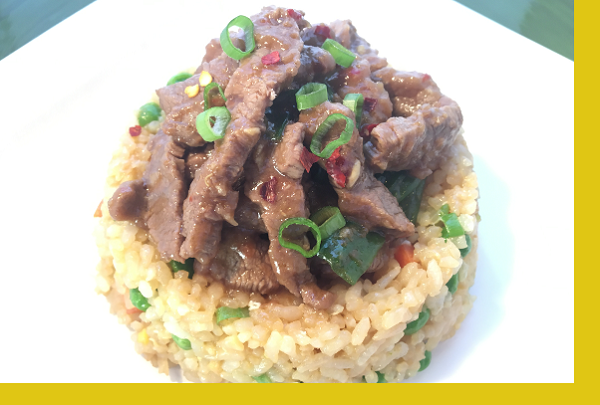 All star, easy to prepare Chinese restaurant favorite. 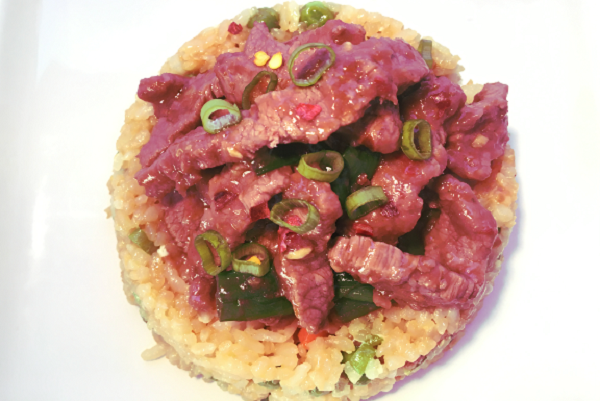 Tender slices of beef and green bell peppers tossed in a savory Asian marinade and served with super delicious fried rice. Kitchen to table in under 15 minutes. Meat: Coat meat in corn starch. Shake off excess. Coat pan with oil. Heat medium-high. Cook meat 3-5 mins then set aside. Cook bell peppers for 2-3 mins. Add sauce and bring to a boil. Return meat to pan and cook additional minute. Fried Rice: Beat egg(s) in a bowl. Heat 1 tablespoon (TBP) oil in a large saute pan over HIGH heat. Scramble eggs and remove. Add 1 more TBP of oil, vegetable packet and saute for 1 min. Add rice and saute 2-3 mins. Add soy sauce and heat 1 min. Mix in egg and remove. We just love this delicious meal. No wonder that it gets so quickly 'sold out'.